Get high-quality reliability at a value price with Jackson® landscaping tools. Forward-turned step ensures secure foot placement. Rugged steel blade stands up to a wide variety of materials: clay, concrete, gravel, soil and more. Sturdy handle supports what the blade can contain. 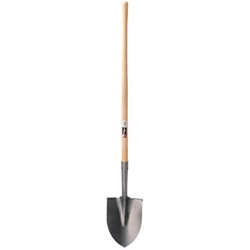 Tool Type: Shovel; Application: Cement/Concrete Working; Farming; Forestry; Gardening; Landscaping; Pipe Fitting; Applicable Material: Cement; Clay; Concrete; Gravel; Mortar; Sod; Soil; Stone; Style: Round-Point Digging Shovel. Shovels, Spades and Parts from Jackson Professional Tools! 600 In Stock today.